Why buy a consumable product when you can invest in an enduring piece you are proud of? Made with heavy-weight 16oz waxed canvas, this tool apron is both water repellent and durable enough to stand up to the toughest tasks. Subtle details make this a stylish piece for both men and women: double reinforced stitching on all pockets and straps; rivet reinforcement on key pockets; metal grommets for a custom fit; and gun-metal colored hardware on flat black canvas for a low-key, professional look. The cross-back (x-back) strap design allows for a custom fit and comfortable weight distribution. Long straps have been utilized to accommodate larger sizes. The ends of the straps have been sewn to prevent them from sliding out of the side grommets, offering ease when taking on and off. 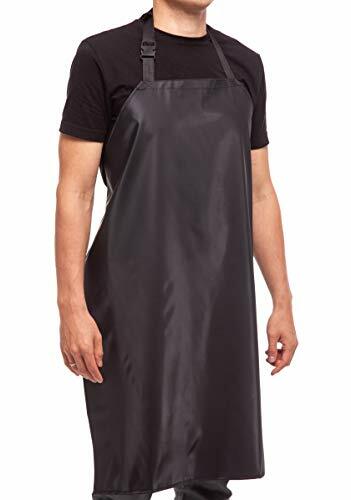 This adjustable bib apron is 27 inches wide x 34 inches tall, making it perfect for men and women of most sizes, including "big and tall". Accommodates waist sizes up to 50 inches. 2 side-by-side tool pockets in the front measure approximately 8 inches wide by 6.5 inches tall each. Behind is a full "kangaroo" style pocket. A chest pocket (approx 4 inches wide x 4.5 inches tall) is designed to fit cell phones, pencils, and small tools. Suggested Care: Gentle scrubbing with a damp rag is recommended for minor cleaning. Machine washing and detergent will deteriorate the wax quality and is strongly advised against. A mild castile soap and water mixture may be utilized to scrub and brush tougher spots. Rewax as necessary with a bar of fabric wax and thorough heating. BUILT-TO-LAST: Build quality that imitators can't match! Handcrafted from water resistant & rugged 16 oz waxed canvas. Reinforced with heavy-weight gun-metal grommets and rivets. Double stitched tool pockets and thick top and bottom hems for strength and structure. ALL DAY COMFORT + CUSTOMIZED FIT: Prevent neck pain with our adjustable cross back strap design. Full coverage bib apron is 27 inches wide x 34 inches tall for unisex sizing (recommended for 5' 2 or taller individuals). Grommets + long straps allow for a range of adjustments up to a 50 inch waist! VERSATILE TOOL POCKETS: Large, easy access tools/accessories pockets in front (8 x 6.5 inch each, accommodates carpenter's square). Quick access cell phone/pencil pocket on front chest. Large kangaroo style hand pocket. Hanging loop on back of bib. PROFESSIONAL STYLE: Low profile design without bulky pockets at your waist. Sleek matte black color for a professional look. Functional & stylish gun-metal grommets and rivets. 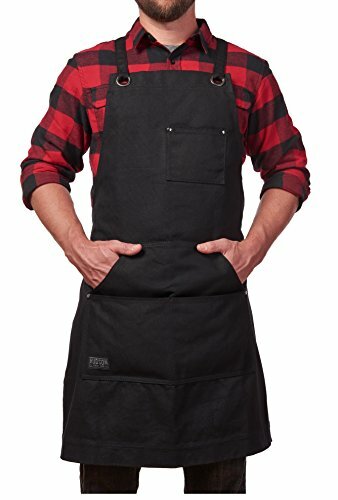 BROAD USE: Tool apron with pockets, utility apron for tool shop, shop apron for carpenters, woodworkers, woodcraft, woodturning, woodshop, workshop, machinists, man apron, tattoo artists, bartenders, metalwork, light welding, metalsmith, blacksmiths, gunsmith, lathe, woodturners, baristas, butchers, brewers, painters, men's apron, woodworking tools, safety gear, apron for men, protective clothing, etc. Unique gift for guys and fathers. Recommended for highways, utility and emergency work. Meets ANSI/ISEAI 107-2010. Reflective striping for day/night visibility in a comfortable polyester T-shirt. Left chest pocket. 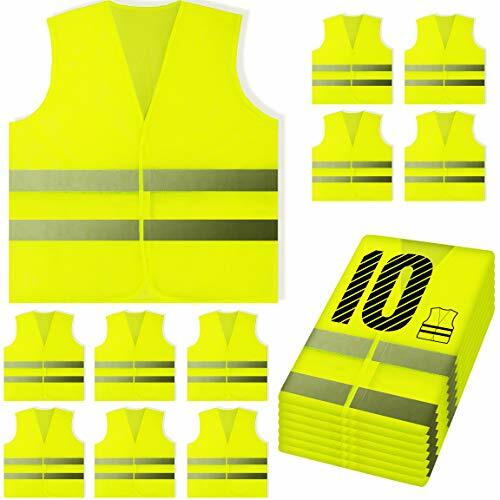 High Quality 10 Pack YellowReflective Safety Vest with Silver Strip This 10 pack of neon fluorescent yellowsecurity vests work great for large groups. High reflective and high visibility strips make sure you and your team are visible. Materials are hand-picked for comfort and breathability. Use these reflective safety vests for outdoor utility, construction, metro, railway, toll work. Great for outdoor use for events and other security/construction jobs. Easy on and off with velcro patch. Keep the team visible and reflective with these great and affordable vests. Limited supplies, get them today! 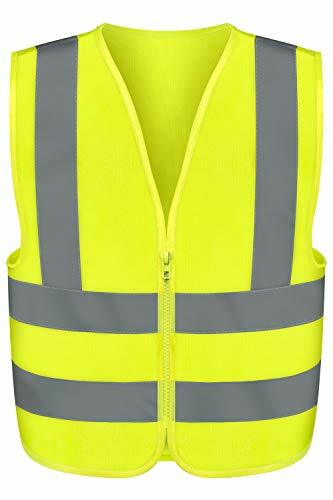 STAY SAFE WITH GREAT VISIBILITY - Fluorescent Yellow Vest with reflective silver strips that wraps entire vest. GREAT QUALITY & ONE SIZE FITS MOST - From small to XL sizes for comfort and breathe-ability. MULTI USE - Great for outdoor utility, construction, metro, running, runners, run gear, security, hunting, volunteer, railway, surveyor, toll work, schools, indoor or outdoor, night or day. Our vests are resilient and strong. 10 PACK - Buy for the whole team, fits most sizes, & affordably priced. We triple check our vests so our quality is unmatched. EASY ON AND OFF - Velcro for quick on and off, no hooks and loop complications. 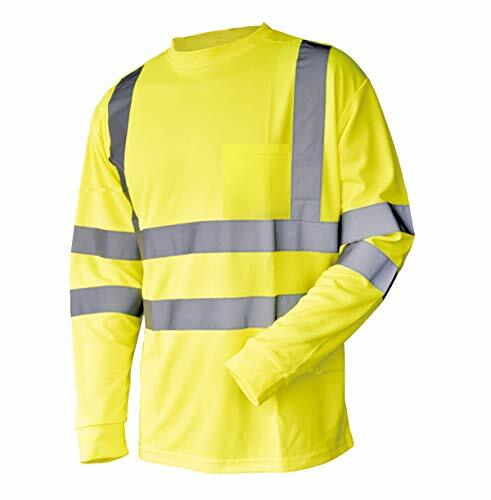 STAY SAFE WITH GREAT 360 DEGREE VISIBILITY - Fluorescent Yellow Vest with high visibility reflective silver strips that wraps entire vest. Hi Vis in 360 degrees. GREAT QUALITY & ONE SIZE FITS MOST - Sized as XL for comfort and breathe-ability. Fits great over jackets and sweaters! MULTI USE - Great for outdoor utility, construction, volunteering, raceway, metro, railway, toll work and workers, schools, indoor or outdoor, security, night or day. Our vests are resilient and strong. EASY ON AND OFF - Velcro for quick on and off, simple hooks and loop complications. Simple and easy. Original goods ONLY sold by Aulett Home! LEAVE WORK DRY AND HAPPY! We have made this 35" x 28" Waterproof Vinyl coated apron the perfect size to do it`s job and last for a long time. The stitching is made with stronger thread then the industry standard. This newest version includes a snap buckle for the neck strap. The ties are a total of 40" long so even the large guys can tie them around their belly, if they want to. The ties are also 25% wider then other offerings, for added strength and comfort. And talking about comfort, you get a FREE bonus pad that wraps around the length adjustable neck strap. Work pain free! The material is soft and nice to wear, yet slippery on the outside for easy cleaning. Get one for your husband, wife or son and enjoy the smile on their face after they finish the job at hand being dry and clean. STAY DRY or get your money back . With the 30 day money back guarantee with 1 year free replacement warranty, tearing from stitches or broken straps are a worry of the past. Original goods ONLY sold by Aulett Home! LEAVE WORK DRY AND HAPPY with this Waterproof Vinyl coated 35" x 28" universal apron. 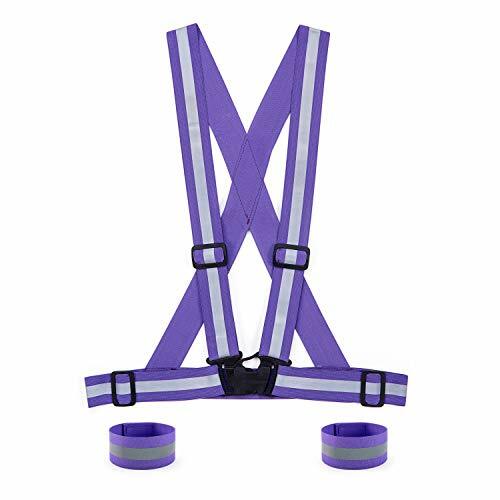 It has STRONGER stitching for the tough guys; 10" LONGER ties for a total of 40", wrap around your belly if you want to; the 25% WIDER ties and the neck strap with a BUCKLE are even more durable and the bonus removable neck strap pad adds EVEN MORE COMFORT. MULTIPLE USES: Great protection for a dishwasher, washing your dogs or trimming the yard. It`s comfortable to wear and has an adjustable length neck strap, so you can choose the perfect height for you. Once you are done, rinse or use a soapy cloth to get the grime off. KEEPS YOUR CLOTHES CLEAN AND DRY while you butcher game; also excellent for cleaning fish or power washing farm equipment. Deflects oil and grease with its slippery outside, yet is soft enough for extended wearing. SURPRISE YOUR HUSBAND, SON OR WIFE. This apron is not just for using in a restaurant or butchers. It offers protection in the kitchen, while doing projects, pottery or arts and crafts. 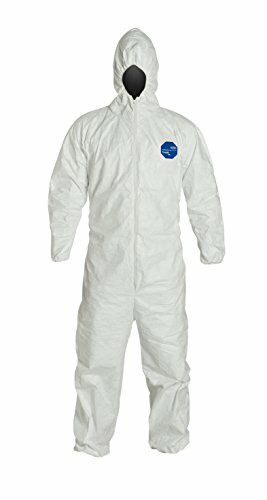 Even use it as a Dexter Costume, if you want to. STAY DRY OR GET YOUR MONEY BACK. With the 30 day money back guarantee and 1 year free replacement warranty, tearing from stitches or broken straps are a worry of the past. Add to cart now. 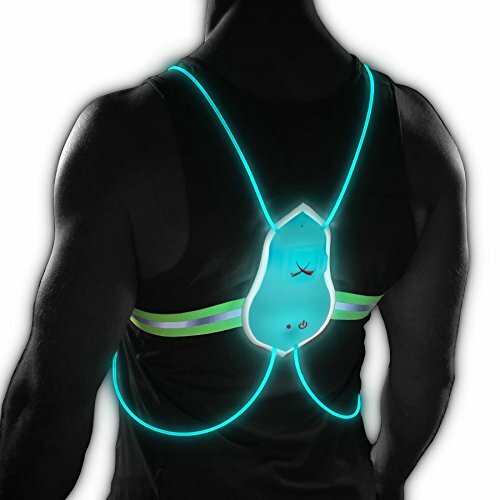 The Noxgear Tracer360 is a lightweight, adjustable illuminated and reflective vest. The Tracer360 includes six multi-color modes illuminating the entire vest. 3M Reflective belt and trim dramatically enhance the visibility. The water resistant, all-season design can be worn over a t-shirt in the summer or a jacket in the fall and winter. Perfect for any runner or cyclist pounding the pavement in the early morning or evenings after work. ALL THE COLORS IN ONE VEST - Change between 6 super bright solid colors - Red, Blue, Purple, Pink, Green, and Orange AND 5 eye catching multicolor flashing modes - Our special illumination modes are based on visual science to give visibility to you and warning to motorists. Modes are easily selectable at the press of a button, easy to access if you're walking, running, playing ultimate frisbee, riding a horse, or even riding a motorcycle. ENGINEERED FOR EXCELLENCE- Noxgear was founded by engineer athletes, who continue to apply the same rigor and discipline as they did designing rockets and robots to providing you a 5-star product with 5-star customer service. Bright fluorescent color enhances visibility in daylight, fog and rain. 360 reflective strips provide maximum reflection and visibility. Longer vest length for comfort. Great adjustability fits many body sizes, one size vest for all seasons. POM material buckle fastens easily. High Quality: Made of high elastic knitted fabric & high-lighting reflective cloth,lightweight, 360 high visibility, maximizes your safety. Adjustable: With elastic straps and 4 adjustable buckles for size adjustments to fits many body sizes you can quickly adjust the waistline and shoulder and snug fit doesn't move around when going outdoor activities. High Visibility at Night: Be easily seen by drivers from 500 yards away, extremely reflective at night and highly visible in the day providing 360 degree visibility. 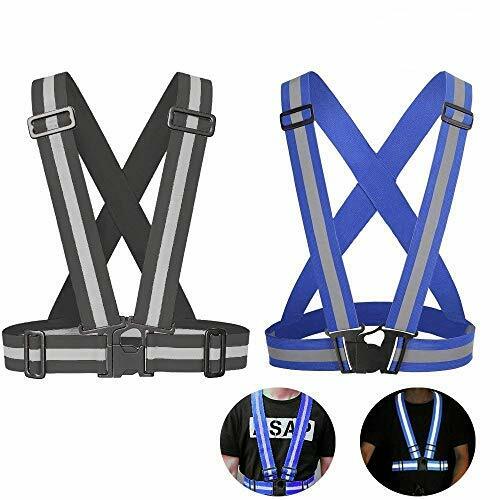 Multipurpose Use: High visibility suspender type reflective vest for outdoor activity like running, cycling, walking, jogging, construction or traffic work. Premium Design: Fully adjustable and breathable design allows for a full range of motion. Fits over any clothing (think bulky jackets, sweatshirts, sportswear). Fits for summer time as well as winter and cold conditions. Serged seams, attached hood, front zipper closure, elastic wrists, and elastic ankles. 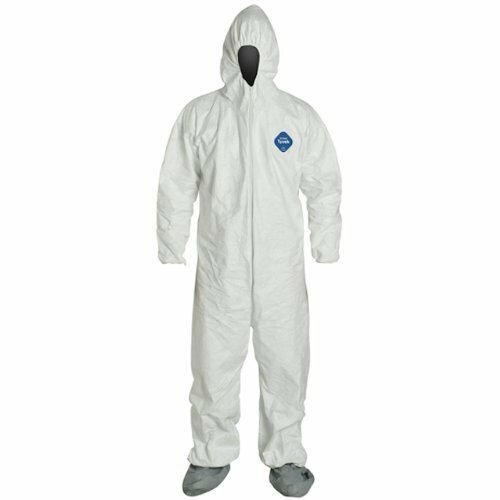 Inherent barrier protection against dry particulate hazards. Applications range from agriculture to spray painting to lead remediation. Even after abrasions, stops microporous particles better than other reusable garments. The best balance of protection, durability and comfort. --adjustable vest range: Waist Band 27-38", Shoulder Straps 15-20"
--Great gift for fitness and outdoor lovers! The Secret to Your Safety on the Roads - The 24/7 Viz Highl Visibility Reflective Safety Vest. 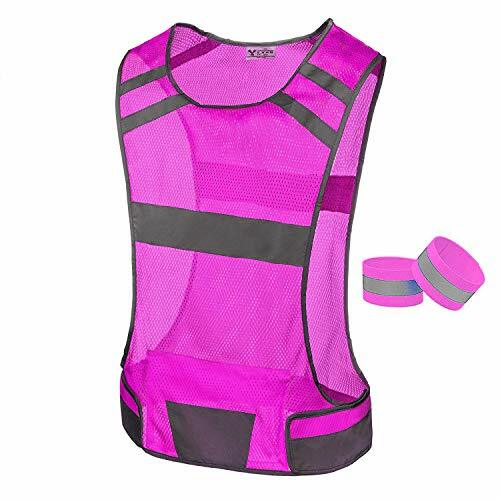 The material is a comfortable and breathable mesh with reinforced reflective strips. The neon color increases your visibility in the daytime and the reflective strips dramatically increase your visibility at night. The main cause of accidents involving pedestrians, runner and cyclists is not being seen by drivers. When you purchase our hi vis vest, we include a set of reflective ankle / arm bands, which adds to your visible surface area. Feel safer on the roads, in both daylight and non-daylight hours wearing our high visibility 360 reflective gear. - Great clothing gift for fitness and outdoor lovers! Click "Add to Cart" Button Now to get your 247 Viz Reflective Vest!